With para-badminton set to make its debut at the 2020 Paralympic Games in Tokyo, Japan, the tournament will also serve as a qualifying event for the 2019 BWF World Championships this summer in Basel, Switzerland. This will be the first-time international para-badminton athletes will meet in Canada, setting the stage for an exciting week of badminton. Badminton’s roots run deep in the city of Ottawa. The city has played host to many past Canadian National Championships, as well as an International Badminton Challenge in 2013. In para-sport, Ottawa recently hosted the 2018 Para-Athletics International Challenge, which showcased some of Track and Field’s top para-athletes. With a history of success, Badminton Canada and the city of Ottawa are excited to welcome athletes from around the world to the Yonex Para-Badminton Canadian International 2019! This event is a qualifier for the world Para championships in August and part of the Tokyo Paralympic qualification. The road to Tokyo makes and important stop in Ottawa this May and it is the only stop it makes in the Americas (North and South) in 2019. We are expecting approximately 200 of the top Para players in the world to come to Ottawa and have a solid planning group in place for the event. We have engaged a top level volunteer manager for this event named Ann Moran. While her primary activity is around volunteers she will also support a slew of other activities for the event. Ann was one of the key managers for the recent Grey Cup in Ottawa as well as the Canada 150 celebrations. 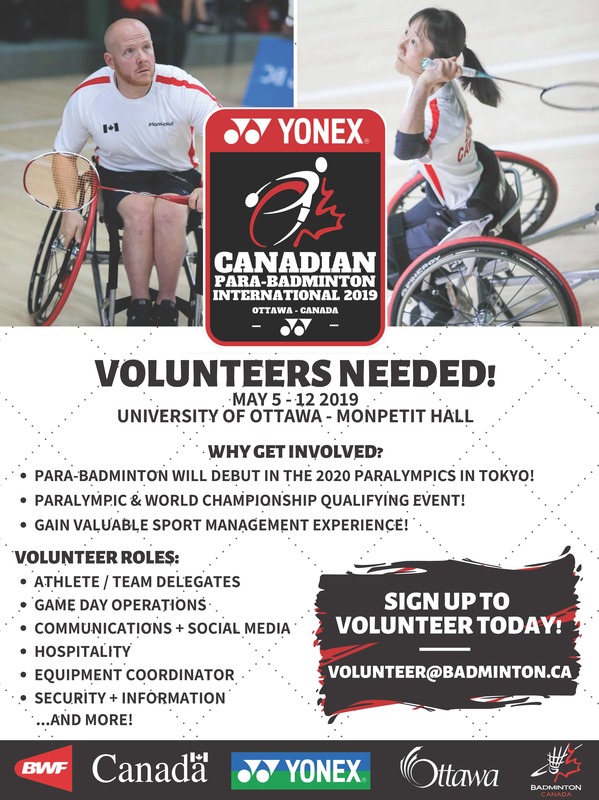 We will welcome any, all availability for volunteers for the Para-Badminton International May 6-12. At this point we are looking for volunteers in all areas of running the event starting May 4,5 to greet athletes/ coaches/support at the airport through to May 13 when we return this group to the airport. A really large need is for line judges for all matches from May 7-12. As Joe mentioned, this is a great opportunity to get involved and get real experience in an international sporting event. It is also an opportunity to see Olympic bound Para-athletes compete while supporting the badminton in Ottawa.